How do I change the Source URL on a Scheduled Pin? 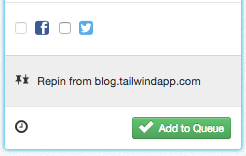 Here's how to individually change the Source URL of any Pin you have uploaded or scheduled. You can see the Source URL of a Pin you've uploaded or scheduled from the web by clicking on the one thats shortened (to the main domain to make it easier to see) at the bottom of the Pin- once you click the URL it will expand so you can see the full URL. If you need to update or change the link, this is the place to do it! You will need to make changes to each Pin individually. Note: All scheduled Pins MUST have a Source URL in order to be published to Pinterest. Find the Source URL address at the bottom of a Draft or Scheduled Pin. 2. Click on the source URL and a text box will expand to see the full web address. Enter the new address here. 3. Click away from the textbox and finally click the, "Save Changes" button. Helpful Tip: When it says "Repin from" it's working exactly the way its supposed to. So long as you're creating this Repin from a public board or feed, we're keeping the actual source on the backend, and it will post correctly just as you expect, with the correct link!